It’s no longer just Les Ballets Trockadero de Monte Carlo and a few male character parts in productions who are donning their pointe shoes for the stage. As ballet’s gender roles grow increasingly blurred, think Chase Johnsey and English National Ballet, more men than ever are stepping en pointe on stage and reaching new heights – literally too. It is arguable that working en pointe has been something lots of training and professional dancers do as part of their work in the studio and preparation for the stage. It can aid their artistic performance and strength in putting their bodies – and feet – through different paces to what they might be used to. 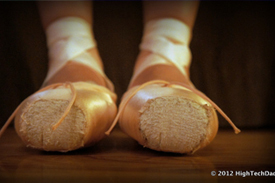 This further experimentation with pointe shoes is a new chapter in the art of ballet and dance. Pointe shoes have generally only been designed for the female foot to date, with some pointe shoes of the all male Les Ballets Trockadero de Monte Carlo designed especially for the dancers. Shoes for these dancers are custom made, as research shows that aside from being significantly longer on average, male feet are typically wider at the ball, instep and heel. Despite this, the heights of the ankle bones, instep and toes can be shorter. Men’s feet are also typically less flexible, and they often support more weight. To this end, pointe shoes cannot simply be made bigger and be used in the same way, although many male dancers do employ pointe shoes in this way. It is thought that in the near future we will see more male dancers performing en pointe, not just in the studio but on the stage too.